A. B. Vajpayee’s NDA Government (1998-2004) heavily disappointed the experts who had predicted “all Moslims into the Indian Ocean” or similar doomsday scenarios—or rather, it put them squarely in the wrong. Hindu “fascism” as a threat to democracy? When Vajpayee narrowly lost a confidence vote, he meekly stepped down. War against Pakistan? Though Pakistan unilaterally invaded India (Kargil 1999), Vajpayee forbade the Army to strike at the invaders’ base across the border, and later opened a peace process, making symbolic concessions which Congress had always refused. Isolationism? He threw the Indian media market open to foreign media ownership, a move opposed by India’s entire political spectrum. The only “Hindutva” thing the NDA ever did was HRD Minister M. M. Joshi‘s clumsy overhaul of the recommended history schoolbooks, changing nothing dramatic and easily reversed. When the Government created a Chair for Indic Studies in Oxford (“saffronization!”), it selected an outspoken opponent for the job, in the vain hope of receiving a pat on the back from its declared enemies. In spite of having a more homogeneous majority, it is reluctant to do anything pro-Hindu or perceivable as anti-minority. On the contrary, one of its first acts was to decree a new subsidy to Islamic schools. The stray Hindutva statements by loose cannon (Sakshi Maharaj, Niranjan Jyoti) were followed by retractions, condemnations by Government spokesmen, and indignant innuendos by Modi-friendly journalists (Tavleen Singh, Swapan Dasgupta). Public reconversions by the allied VHP, heavily publicized and demonized by the media, were promptly discouraged by the Government. Having learned from Vajpayee’s 2004 defeat, though, Modi does “keep the pot boiling”, does regularly throw crumbs of inconsequential Hindu symbolism to his support base, all while not formally changing anything. However, if many BJP workers are disappointed with this Government, is not for what it does but mainly for what it persistently fails to do. Thus, it inducted no figures with a strongly ideological profile (Arun Shourie, Subramanian Swamy). Likewise, some public figures who had crossed the floor (e.g. Madhu Kishwar) were conspicuously not rewarded—a fact not considered here for disgruntled ego reasons but for illustrating the BJP’s lack of strategy: it doesn’t put people who have actually sacrificed for the BJP to any use, while awarding positions of influence to unreliable newcomers motivated by sheer opportunism. While some things on the Hindu agenda are either useless to Hinduism (e.g. declaring a “Hindu Rashtra”) and others would arouse violent protests for which the media are sure to blame Modi (e.g. a Common Civil Code, though “secular” par excellence), others are perfectly feasible and, moreover, turn out to be the most consequential for the flourishing of Hinduism. In particular, the amending of Constitutional Articles 28 and 30, which (de facto c.q. formally) discriminate against Hinduism in education, does not take away any rights from the minorities, yet lifts an enormous burden from Hindu organizations investing in education and eliminates a major reason for Hindu sects (Arya Samaj, RK Mission, Lingayats, Jains) to have themselves judicially declared non-Hindu minorities. Similarly, eliminating the legal basis of the discrimination against Hinduism in temple management, with rich temples (but not mosques or churches) nationalized and their income pocketed by politicians or diverted to non-Hindu purposes, would give an enormous boost to Hindu religious and cultural life, without impinging upon the rights of the minorities. It has to be noted, however, and it buttresses my case for “BJP secularism”, that temple management is partly a competence of the States, and that BJP State Governments have not made the difference. At any rate, there are meaningful things a BJP Government could do specifically for Hinduism without endangering its non-religious agenda (development, cleaning India etc.) or its international standing, yet it chooses not to do them. As for the Hindutva fits and starts of some BJP members, now considered extremists but in fact only representative of what the erstwhile Jan Sangh (1952-77, predecessor of the BJP) stood for, it should be easy to bring them in line around a more reasonable but still credibly pro-Hindu programme. It is here that the BJP is most conspicuously failing — conspicuous at least to insiders, for 99% of the outside literature about the BJP never mentions this phenomenon. Contrary to a consensus among academic and journalistic India-watchers, the supposed “Hindu extremist” party has no Hindu agenda. It relies on pro-Hindu workers to do the campaigning legwork, but once in power it cold-shoulders them, it publicizes and pursues an agenda of economic development only, and it tries to curry favour with the secularists. The main reason is the long-standing deliberate lack of investment (pioneered by M. S. Golwalkar) in an intellectual and strategic vision of its own, the spurning of any analysis of the forces in the field and of the potential and limitations of the situation. It therefore also lacks competent personnel for the ideological struggle, e.g. for a textbook overhaul or, now, for nominating politically friendly new Vice-Chancellors. Consequently, most BJP leaders have an enormous inferiority complex vis-à-vis the secularists and, even when in office, try to live up to the norms laid down by their opponents. » Dr Koenraad Elst is an indologist and historian from Belgium who publishes with Voice of India. Waking up to the sonorous voice of Birendra Krishna Bhadra, reciting the intensely poignant Mahisasuramardini, announcing Mahalaya, is a moment of extraordinary significance for Bengali Hindus. Its memory prompted me to reflect on the catastrophic fate of contemporary Bengal. Dolorous is the word that instantly comes to mind, when contemplating the intellectual, spiritual and moral disintegration of Bengal. Its historic antecedents are in the attempted partition of Bengal under Lord Curzon and its eventual occurrence four decades later. The trauma of the experience gave rise to a self-destructive malaise, paradoxically and inexplicably, presided over by communist refugees fleeing Islamic Jihad in East Pakistan. The final political chapter is being written by the banal phenomenon of Trinamool Congress. Under the bizarre rule of its leader, idolised by many Bengalis, a major growth sector of the local economy is middle class prostitution, testament to the moral nullity that has overtaken its society. The Bengal renaissance that led India into modernity, reaching back into its Vedic past, gifting the world Swami Vivekananda and a galaxy of luminaries, has all, but evaporated. No profound reflections by a sage like Rishi Aurobindo, unprecedented scientific endeavours of a Jagdish Bose and Meghnad Saha or poet of Tagore’s astonishing talent or the renowned filmmaker Satyajit Ray, have emerged in recent decades. And nor is there in the horizon a new grammarian, linguist and moralist, echoing Montaigne, like Ishwar Chandra Vidyasagar, taking humanism to new heights, clad in modest dhoti. Instead Bengal’s post-independence educated class unleashed nihilistic bloodlust on society in the name of a Chinese warlord, Mao Zedong, in cahoots with Islamic Jihad and then fled to a salubrious life abroad. This cynical and self-seeking cabal has since been virtually urging US and Western imperialist intervention to curb India’s alleged descent into Hindu fascism! Of course Hindu civilisation itself has also been in retreat for more than one millennium, although its reluctance to acquiesce to an ultimate coup de grace is both remarkable and puzzling. In the aftermath of the transfer of power in 1947, completely erroneously labelled peaceful, this historic hiatus of an endless pause from socio-cultural erasure appears to have been broken. Hindus are now descending rapidly towards cultural and spiritual oblivion. Independent India had fallen under the suicidal spell of an eccentric, the kindest accolade he could be accorded, and he nominated a primus inter pares ill equipped to secure and defend the civilisation of Indica. 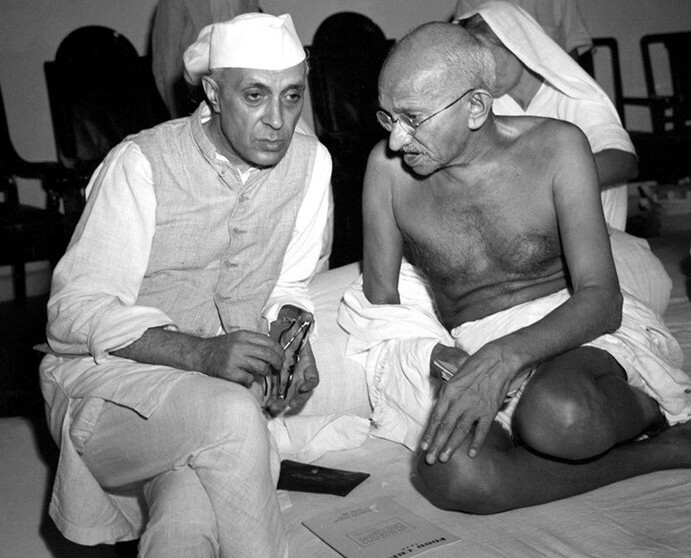 It was also at his insistence that the new government of India was obliged, by the threat of a fast unto death, to fund the very war the state of Pakistan unleashed against India within months of partition. His tragic murder consigned the fate of Hindus and any prospect of social and spiritual renewal to the ideological detritus of the departing colonial power. The outcome has been a conspiracy to impose an ideology on the fledgling republic that eventually empowered Islamic Jihad, Christian resurgence and grand larceny as its abiding motifs. The chosen nominee for the premiership of independent India was himself from a morally bankrupt Kashmiriyat political tradition of incoherence and imbued with vaulting self-regard that had already surrendered its own community to predators, although the endgame awaited the 1990s. His family subsequently sought to turn popular Indian democracy into indefinite dynastic rule, by nurturing every latent fault line and endangering the nation’s very survival, until boundless greed overwhelmed all judgement and common sense. It is they, who were responsible for the immeasurable tragedy of the Punjab, in a vain and imbecilic attempt to augment regional political power to dominate the Centre. Their earlier catastrophic follies in relation to Tibet and Kashmir are open IOUs to fate that hang like a sword of Damocles over future generations. The recent rise of Narendra Modi, who ended the unfolding calamity abruptly was considered to be the moment of a reversal of rapid decline, though it could not be and was nothing of the sort. In the meantime, Hindus are in confused retreat on multiple fronts. The best outcome they can apparently hope for and many earnestly seem to desire, is to become like Koreans, with the accretion of a degree of prosperity, but without history or their rich and vibrant antecedent traditions and culture. Korea is now largely a Christian nation and its remaining Buddhists dismayed at waning state patronage of their age-old religious and cultural heritage. What historical national identity Indian secularists would prefer without Hindu antecedents is a mystery, since all culture and memory permeate it. The defining societal hallmark of this terrifying prospect is the growing insignia of the Ambanis and Vijay Mallya rather than the sage Adi Shankaracharya and divine Swami Vivekananda. Wealth, its grotesque display and obscene consumption, imitating the imperialist and racially arrogant elites of the US, is the warped longing degrading the humanity of Hindu society, as it has done elsewhere. Self-restraint and genuine concern for the welfare of the many in desperate circumstances, the essence of self-realisation and godliness, appear to have been substituted by the moral universe of Hades. Abroad, Indian humanities and social science academics have been whipped, en masse, into an incomprehensible and incoherent frenzy of rage against imaginary signs of supposed Hindu self-assertion. So ferocious is their desire to curb this alleged Hindu descent into fascism, embodied by Narendra Modi’s modest electoral success, they are evidently willing to join hands with Islamic Jihad to protect the oxymoron of Indian secularism. Some among them not-so subliminally seek armed international intervention to protect their terrorist allies from the wrath of the Indian state, under the guise of minority rights, and, presumably, to prevent church window panes being broken in India. The genocidal impact of such intervention, visible in the Middle East, is possibly regarded as an incidental bonus! Foreign governments like the US and the UK, which have always had malign intentions towards India, want to use it as a pawn against China, though the prospect of betrayal in a Sino-US deal that institutes condominium is the most probable outcome. Significantly, both governments and their European allies, aided by the Republic of Korea, are waging a deadly war simultaneously to permanently subvert Hindu civilisation through religious conversion. In a recent visit to Nepal, I was stunned to be told by several knowledgeable public figures that the Church privately boasts about how a third of the population has already embraced Christianity. Christianity has indeed advanced in Nepal through allurement, subterfuge and outright bribery, including a multimillion dollar inducement to a former prime minister. The dramatically successful campaign of religious conversion in Nepal, across India and within the UK itself, abetted by some infiltrated British Hindu social and religious organisations, highlight the perversity of the situation. Yet the rise of Narendra Modi represents a moment of respite and hope. Having inherited a parlous nation, in the throes of economic, political and moral chaos, the appropriate priorities for reversing its decline are easy to debate and dispute. And the authority and power he and his government enjoy are not unfettered, as political and social life in India brutally demonstrated in the past two years. The incumbent government is besieged on many fronts by an array of truculent adversaries, determined to thwart even the most indispensable policy measures. International conspiracies, originating in foreign capitals, aided by treasonous domestic surrogates and incited by a suborned anti-national media, abound visibly. The urgent task of national economic revival is preoccupying the Modi government’s attention and socio-cultural initiatives appear to enjoy less prominence. However, the task of securing the nation’s future in a hostile world, by creating national productive capacity and ensuring future electoral consolidation, surely depend on the overall policy stance adopted by Narendra Modi. Hindu society is also stirring elsewhere, silently, but with heartening self-confidence. The wave of a massive movement, Hindutva Abhiyan, for example, is spreading from the apparently unpropitious and obscure tribal districts of Mandla in Madhya Pradesh to adjacent regions and beyond, across India. It draws its inspiration from the likes of Vivekananda, Aurobindo, and Chanakya and promises to overturn the long-held accepted norms of acquiescence to threats against Hindu society and the retreat that usually follows. » Dr. Gautam Sen is President, World Association of Hindu Academicians and Co-director of the Dharmic Ideas and Policy Foundation. He taught international political economy at the London School of Economics and Political Science for over two decades. Dr Koenraad Elst, a scholar from Belgium who deliberately calls himself an “Orientalist”, is the author of many publications on Indian religion and politics. Among them is the book On Modi Time (VOI 2015), evaluating how the BJP’s policies measure up to its erstwhile Hindu ideals. He says that the BJP is assiduously following a roadmap towards massive defeat. The party’s inconsistent economic policies are chasing away several of its natural constituencies. Q : Do you think the BJP is still in opposition, ideologically speaking? If so, what must the party do to turn the tables on the secularists? A : On economic issues, the party has the advantage of the identification of its adversaries with mismanagement. The Congress’s return to socialism undid the high growth rate India enjoyed at the end of the previous BJP government. However, the blind adoption of American free-market policies is at odds with any Swadeshi commitment the BJP once had, and is chasing away some important constituents. On the cultural front, the less said, the better. Even when in power — no, let me correct that: when in office, for “power” means the ability to change things according to your own designs, and the BJP shows no signs of wanting to change anything. So, even when in office, the BJP plays by enemy rules and even thinks in the categories laid down by its enemies, with Hindus as an ugly overbearing majority that needs to be kept in check, and the poor hapless minorities as needing extra favours. Everybody could see this at the time of Barack Obama’s visit. Fed hostile stories about the BJP’s “Hindu fanaticism” by the secularists, he berated this government for injustice to the minorities. Instead of giving the arrogant US president a lecture about India as a shining example in its treatment of religious minorities and refugees, Modi swallowed the misplaced reprimand and reproduced it himself to his own countrymen the next day. That was Hindu-bashing secularism issuing from the mouth of the Hindu Hridaya Samrat. It was Nehru speaking through Modi. Q : How will you like to describe the volatile situation in India in the wake of incidents in JNU? Is it rise of internet Hindus or that of angry India? A : Freedom of speech does include the right to make anti-national statements. If it doesn’t mean the freedom to offend, it doesn’t mean anything. The Motherland is not above criticism, even if misguided, just as the Prophet is not above criticism. So I am sorry to break ranks with most Hindus, but I think these anti-national slogans at JNU are much ado about nothing. It is commotion over mere words illustrating a lack of action, of real steps towards more national integration. Angry India should calm down and instead do the needful to fully Indianise Kashmir. Q : What do you think the Modi government must do for the right without offending the minority community? Especially when he has been knocked out of Delhi and Bihar? A : Where does the minority come in? Apart from raising the Hajj subsidy, how has Modi harmed any minority? At any rate, nobody should be harmed, not Akbar, not Anthony, and not Amar either. You worry about not offending the minorities, but the majority should not be offended either. In that regard, some constitutional, legal and policy reforms are needed to undo the existing discriminations against the Hindus, especially in education and temple management — and all this without diminishing a single prerogative of the minorities. But the Modi government is not moving at all in this regard. Moreover, it is a bit rich to call Indian Muslims and Christians “minorities”. Not only are they more numerous than the population of many countries (say, Saudi Arabia), but they are only the Indian branch of worldwide movements. They benefit from international financial and media support that the Hindus cannot even dream of. More fundamentally, the concept of “minority” is reprehensible in itself. Every democrat can understand that the law should equally apply to all, regardless of religion. Every Indian citizen may sociologically be a member of one or more communities, but legally, he is just an Indian citizen. That is the minimum for a state to be secular. India today is not a secular state at all. An Indian political analyst or a foreign India-watcher outs himself as incompetent when he asserts or implies: “India is a secular state.” It is not. Q : What do you think should be roadmap for the BJP to return to power in next Lok Sabha elections in 2019? A : Right now, the BJP is assiduously following a roadmap towards massive defeat. The BJP secularists, dominant in the party’s upper layer, claim that this government was elected on a secular platform of development. But even charitably assuming this, the party’s inconsistent economic policies are chasing away several of its natural constituencies. In reality, Narendra Modi was brought to power because the dominant hostile media had successfully portrayed him as a militant Hindu—an image which the BJP itself downplayed or denied. The often sceptical Hindu voters turned out in large numbers because here at last they saw a man whom they expected to fight for Hindu causes. Baba Ramdev spoke for millions of Hindus when he said: “I voted for Modi, not for the BJP.” But once in office, the BJP disowned the numerous volunteers who had worked for Modi’s victory and systematically let its Hindu constituents down. Millions of Hindus will not return for the next campaign nor even in the voting booth. And if they do, it will not be to support the BJP. Two factors still work in the BJP’s favour. One is the opposition’s weakness. Its capacity to unite and defeat the BJP, as in Delhi and Bihar, is harder to repeat at the national level; and Congress remains impotent as long as it doesn’t side-line Rahul Gandhi. Not that these mindless time-servers will suddenly feel guilty about having betrayed the Hindu cause. But politicians care about winning elections, and it might suddenly dawn on them that the secular vikaswallahs (“development”-ists) in the government will never gain them a majority. These BJP secularists have been useful in the BJP’s bid for a pat on the shoulder from the Nehruvians (in vain, but count on the BJP not to notice this outcome), but they are not the ones who will do the campaigning for the party. Only Hindu volunteers, including many RSS militants, will do that. I have plenty of criticism of the RSS, but I acknowledge that its rank-and-file has its heart in the right place and is willing to put in real work for the Hindu cause. However, if they don’t get to feel that this has been a really Hindu government, they will fail to show up in 2019. And without them, the BJP has no chance. An insider to the BJP’s core group told me that the A. B. Vajpayee government erred in not doing anything visibly pro-Hindu at all. He admitted that this had been a major cause of the BJP’s surprise defeat in the 2004 elections. The proper lesson would be to implement pro-Hindu policies this time around. However, that is not what the BJP has in mind. All they want to do is to “keep the pot boiling”: whip up some Hindu emotions, but without doing anything. So, when visiting Dhaka or Kathmandu, BJP dignitaries make sure to be filmed while visiting a local temple in order to suggest a difference with the previous, secular government. That costs them nothing and yields Hindu society nothing, but it looks Hindu. The cow slaughter issue also came in handy, it arouses real feelings among the Hindu masses. But in the long run, this is not going to save the BJP. You can’t run after the approval of your enemies (who will never vote for you anyway) while spitting on your core constituency. Q : How do you look at serious negationism (historical revisionism) in India when one talks about Islam? A : The issue should not be dramatized. It is only history. And of course contemporary Muslims should be left free to distance themselves from the crimes of Ghaznavi or Aurangzeb. But the true story must be told. However, after Murli Manohar Joshi’s failed attempt to rewrite the history textbooks ca. 2002 (a horror show of incompetence), there is not even an attempt in this direction. On this front, the mendacious secularists have been gaining a lot of ground, in spite of eating humble pie in the Ayodhya controversy. The attempt by the Eminent Historians (and their Indian and foreign dupes) to deny the existence of temple foundations under the Babri mosque has been completely discredited. Yet, their underlying message that there never was an Islamic policy of temple destruction, and that it emulated a similar pre-existent Hindu policy, has won the day. Thus, when I speak about the Ayodhya affair, there is always someone in the audience who asks whether that temple destruction wasn’t but an imitation of what Hindus had done. That belief wasn’t around twenty years ago. This shows the systematicity of secularist propaganda. While the Eminent Historians thought they could simply enforce their denial of Islamic iconoclasm, their American sympathizer Richard Eaton understood that at least some iconoclasm had to be admitted, but that the blame for it could be passed on to the Hindus. So he spun the story that a few cases of “idol abduction” by Hindu warlords, who re-installed captured icons in their own temples to continue their worship, amounted to the same thing as the thousandfold Islamic cases of destruction of icons. Immediately the secularists seized upon this story and propagated it through all channels. By contrast, my paper refuting this story was completely ignored by the Hindu militants, too smug and lazy to even take notice. The result in a sizable anti-Hindu switch in public opinion, even among common Hindus. Q : The Hindus are more individualistic. They lack collectiveness. Is it a death instinct? A : To some extent it is a healthy attitude. The Indian Republic is very correct in giving only a negative definition of “Hindu”: any Indian who is not a Muslim, Christian or Parsi. That is also the historical definition applied by the Islamic invaders who imported the word “Hindu”. A Hindu is just a normal person who happens to live in India, whereas Christians and Muslims are defined by their adherence to a superstitious belief. But yes, this common belief unites and mobilizes them, whereas the Hindus have to do without this standard to rally around. Q : Must the Hindus in India have a media house exclusive to the community? Kindly elaborate. A : “A media house exclusive to the community” is the kind of refuge that a minority would seek comfort in. Hindus should be more ambitious, and wrest the leading media houses back from the secularist stranglehold. They don’t need to be exclusively Hindu. Just fair to Hindu positions, open to Hindu contributions, free from their present Hindu-bashing, that is good enough. Exclusive media support to one religion, like state support to religion, is a bad thing. » Shitanshu Shekhar Shukla is a senior journalist and columnist.